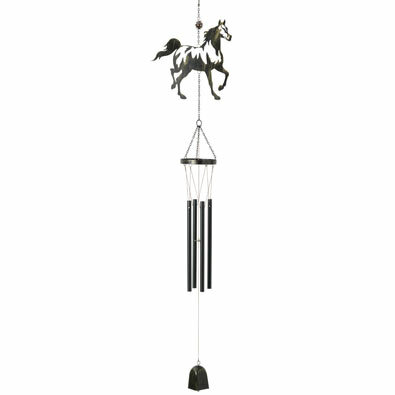 The details of this wind chime will surely delight; from the glass bead at the top to the prancing metal horse all the way to the cow bell at the bottom! An impressive 36" long from hook to bell. The details of this wind chime will surely delight; from the adorable orange cat at the top to the glass fish surrounding the four metal chimes. An impressive 34" long from hook to fish clapper. Glass and metal cat measures 3-1/2" wide.